Many of your images will probably not be sized to the exact dimensions you need. You have several options at your disposal. 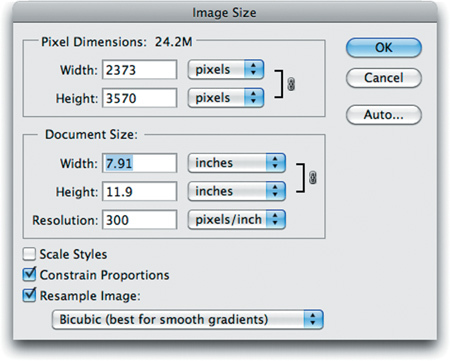 To change the size of an image, you can use the Image Size or Canvas Size command. You can also use the Crop tool or Free Transform command to make an adjustment. You can use these choices individually or in combination to achieve the desired results. Open the file Ch04_Dawn.tif . Choose Image > Image Size or press Command+Option+I (Ctrl+Alt+I). The Image Size dialog box offers several choices. You can choose to manipulate the pixel dimensions of the image (measured in pixels or percent). 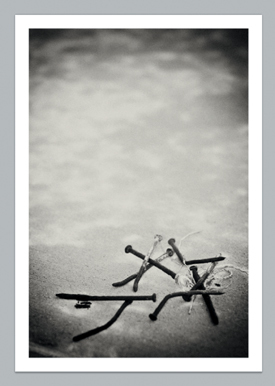 You can also modify the print size, which is the size of the image when printed. You can modify the print size based on percent, inches, centimeters, millimeters, points, picas, or columns. The most common choices are percent, inches, or centimeters, because most users easily understand these units of measure. Set the Document Size to measure in inches. Specify a new height of 6 inches. Be sure to select the Resample Image option if you want to change the pixel dimensions. Choose the method to Resample Image that is most appropriate for your image. Bicubic is the most common method, but you may have special circumstances. You can avoid the need for upsampling by scanning or creating the image at a sufficiently high resolution. If you want to preview the effects of changing pixel dimensions onscreen or to print proofs at different resolutions, resample a duplicate of your image. Leave the Constrain Proportions check box selected, or you will introduce distortion. You generally want to keep the width and height constrained to the same ratio so the image resembles its original appearance. Enter a resolution of 300 pixels per inch for professional printing. Open the file Ch04_Nails.tif . Choose Image > Canvas Size or press Command+Option+C (Ctrl+Alt+C). 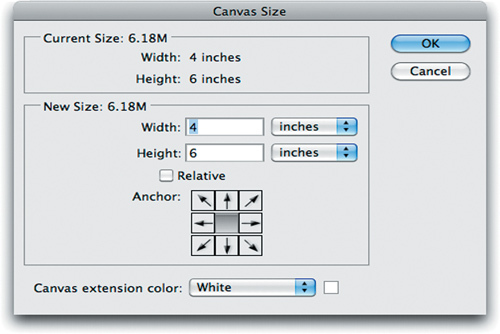 In the Canvas Size dialog box you’ll see the dimensions of your current canvas. You can specify a new canvas size using a variety of measurements. Pixels is a useful measurement if you’re creating screen graphics, whereas inches or centimeters is easier to understand for print work. Using percentage is also good for incremental amounts. Let’s place a uniform border around the image. Select the Relative check box. This disregards the numerical values of the current canvas size and allows you to specify a new amount to be added to the existing image. Ensure that the anchor point for the image is set to centered. This will expand the border in all directions around the center of the current image. Add a half-inch border on all sides. Type .5 inches into the Width and Height fields. Specify a Canvas extension color. This is the color that Photoshop places around the image when you change the canvas size. 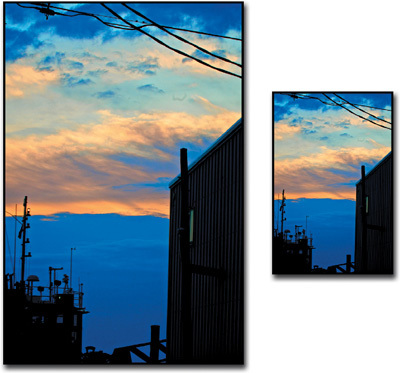 You can choose to use the foreground or background colors that are loaded in the toolbox. You can also use white, black, gray, or other, which can be any color you specify. In this case, choose white.